. Your child can play the Save the Trees Lorax game by clicking here. Even better than playing computer games, plant seeds and trees with your child. It is fun to watch them grow with your child. The redwood we planted when my daughter was four years old is definitely outgrowing her! This is my favorite book from growing up. Now my 16 month old loves pointing out the Lorax when we read it. The next step will be planting trees with her. For her birthday, I plan to get her a membership to the National Arbor Day Foundation. What a great birthday idea! I love sharing books with my kids that I enjoyed as a child. I didn’t discover the Lorax, until I was in high school. 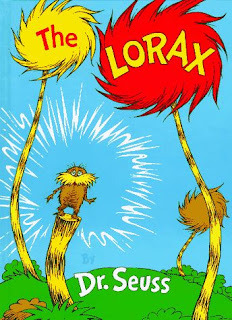 I used The Lorax all the time when teaching environmental education to kids of all ages. Even high school students love it. My two year old loves the book too. I recently found toothbrushes with the Lorax on them. At first glance I was excited because it was a kid sized toothbrush without a disney character on it. But then the irony (is that the right word in this case?) struck me. Goodness, a character that’s all about saving the environment is being used to sell plastic, non-recyclable toothbrushes. What’s next?! Yes, that is ironic. I hope the Lorax toothbrushes are at least made from recycled plastic. I love the idea of instilling in my 2.7 yr old a sense of awareness for our surroundings and a respect for our world. I want her to grow up respecting and nurturing the world that sustains us, but I have to tell you that as a single stay at home (working only a part time so that I can be with my daughter until she is 4 yrs old at which I WILL have to go back to work) and not having a trustfund or other substantial financial resource to sustain us I just can’t afford to buy a $2.85 tissue box, as much as I want to support environmentally safe practices. I grew up in Cuba where hankerchieves were the only standard. I continued to use them until my grandmother passed away and so many of our cultural practices died down. I have been for the past few years especially since Madi was born reconsidering using them (despite the fact that we don’t have a washing machine at home and send out our laundry to be done). Reading your entry this morning has convinced me that I will return to handkerchieves when outside the home, but I would still love to find a more financially friendly alternative than a $3 (with tax) a box option for home use. Before parting, I just want to tell you that I came accross your blog about a week ago and signed up. I have thoroughly enjoyed every single entry so far. It is the first time that I sign up for something that I actually have enjoyed receiving and which I look forward to rather than ending up unsubscribing. Thank you for your terrific efforts. Thank you for all of your compliments! It is a shame the eocfriendly products cost more, but then again, I think we have become spoiled by low prices in this country (US), which causes us to overconsume. I use cloth diapers for runny noses too, but I do have the luxury of a washing machine. I hope you can find a cheaper alternative! Let us know if you do.